In the spirit of open-source, all materials are free to educators for use with their own learners—no advertising, no signup, no strings attached. These files contain both learner materials and notes for teacher or mentor. On request, we’ll supply links to files with learner materials only. 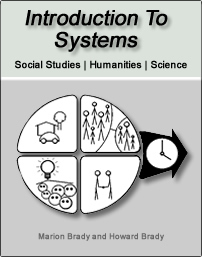 Introduction to Systems provides learner-directed activities for a year of study for adolescents and older learners. In a complex world, making sense of reality is essential to human survival. From galaxies to atoms, from nations to individuals, everything is a system or system component. Because every human problem is a system problem, understanding how systems are put together and how they work is the indispensable foundation of an acceptable general educational curriculum. In sequenced, "hands-on," jargon-free, real-world activities based on General Systems Theory, Introduction to Systems helps learners construct a comprehensive, easily-understood, permanently useful conceptual framework or mental model for describing and analyzing phenemona.